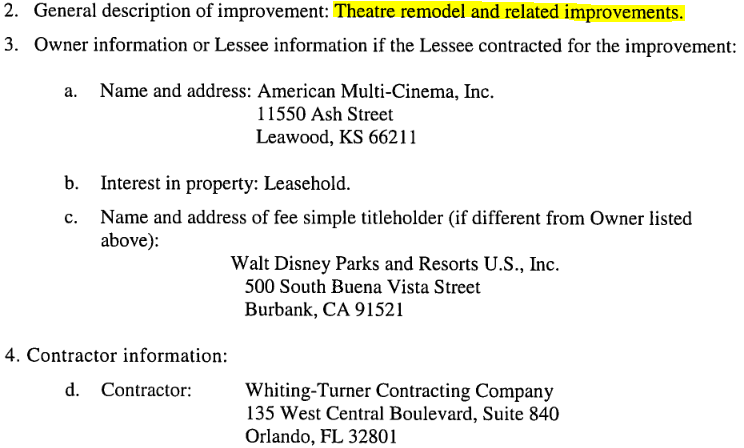 A Notice of Commencement was filed today for "Theater Remodel and related improvements" for the Disney Springs AMC. Hopefully this is an extensive remodel, as the theater very much needs an update, in my opinion. The contractor attached to the project is Whiting-Turner, who generally do very large jobs, so I'm hopeful the entire place will get a nice, modern refresh. I'll be curious to see if any of the theaters are being redone to be more like their Dolby auditorium. That was a great refurb, but it cut the seating amount by nearly half. Most the the auditoriums are in reasonably good shape, but a few need some TLC. I expect it to be adding one or two of the non dining theaters to the dine-in side and possibly reconfiguring flow. I know I heard they wanted to add another theater or two to dine-in, and I also recall hearing that they wanted guests to be able to come in from either side again. I could see them reconfiguring more than a few theaters, but as nice as it would be, I don't see theater 2 becoming a Dolby/IMAX/etc. theater. I could see them converting 17 & 18 to Dine as those are the small theaters near that end (maybe 16 at well as the're all in that row). There is always some confusion for folks not familiar with the theater on the regular vs. dine entrances; with the dining side facing the larger end of Disney Springs they could do with a flow change. I don't think there is any AMC that has dual Dolby auditoriums, there isn't really much call for it. There just aren't that many Dolby Vision/Atmos releases. The Dine-in side needs a bigger kitchen if they are going to add more theaters. I used to work at this location and they can barely service the amount of theaters they have now when popular movies come out. Food comes a lot of the time towards the end of movies and people understandably get very upset. WRT Dolby Vision/Atmos releases, that’s beginning to change. Amongst the big films this Christmas are “Aquaman”, “Bumblebee”, “The Grinch”, “Mary Poppins Returns” and “Spider-Man: Into the Spiderverse” have been mastered in Vision/Atmos. Only one film can fill the Dolby slot in each AMC theater with a Prime Dolby auditorium, meaning lost upcharge $$$. And more films will be released in Dolby Vision/Atmos as time goes on. It would be most prudent of AMC to convert two or more auditoriums over to Dolby at DS. Overlaps in releases definitely occur with such specialty theaters and are often problematic because the lack of screens. But the logjam that happen with the Mary Poppins/Aquaman/Bumblebee trio is a rare enough occurrence as to not be as damaging to theaters as one would think. Theaters are pretty good at predicting what shows their local market are willing to pay an up-charge for. In the case of the Disney Springs AMC, to do another comparable to #1 sized Dolby (with 271 available tickets) they would have to convert either #2 (with 533) or combine #12 and #13 (at 360 each - 720 for both). Just on ticket sales at their current price either conversion with a standard 2D full house is more valuable that a full Dolby house at that size. More available tickets at the base level are almost always going to translate to more bodies in seats that will spend more money on concessions. Does AMC introduce a reclinerless Dolby Vision/Atmos product? That solves for the screen availability problem and your seat capacity issue. Looking 5-10 years out, that makes a lot of sense for them. "AMC Disney Springs 24 Theatres will soon be getting some major upgrades. Beginning January 7, AMC Theaters will begin work to expand their current number of dine-in theatres, enhance the existing dine-in theatres with recliners, and refresh the restrooms, concession area, and bars." Much needed renovation. It's a shame they aren't renovating /installing recliners in the majority of theaters though. I recall reading this location is one of the top five most profitable for AMC nationwide- they should be able to afford recliners here like they do in most of the NYC theaters. Space might be an issue but I figured at least some of the theaters would be getting them. I have mixed feelings about watching a movie with all this going on. I feel like even if I were at the "bar" ordering drinks, I'd get bored of the movie aspect of this. It's kinda like, put something on while we hang out. I just wish the theater had similar recliners to the other theaters in the area in the regular auditoriums. I've done the Dolby Cinema a few times and I hate them. They don't fully recline your legs, so I'm like "what's the point?" Been to others like Regal and it's so much better. It makes more sense for the dine-in section, although I can't stand that experience. I would rather watch a movie with the lights dark and no distractions, personally. If the theater is pulling in good attendance numbers, I wonder if there is any benefit to putting in recliners. Recliners reduce your capacity, but I don't know if the higher price theaters charge for this offsets what a busy theater would make on the lost seats. Glad to hear this - they need to refresh the bathrooms badly. Saw Ralph Breaks the Internet there last week on the Dine-In side and they were as gross as I remember. We very rarely go to the movies, but we always choose Cinépolis in Posner Park instead due to cleanliness. We didn’t have a choice this time since the movie had been out long enough already. We did the Fork and Screen option when Crazy Rich Asians came out. We enjoyed the experience a lot. I thought it would be very distracting, but I was surprised I was not taken away from my movie experience at all. Now if only they would add silent, touch-screen ordering. Staff taking orders and leaving checks are more distracting than someone texting.